Blending with the sleek, contemporary design of The St. Regis Bal Harbour Resort, the neutral-colored Remède Spa Bal Harbour offers all the spa amenities you desire, plus a few decadent extras — heated marble floors for your feet, cashmere throws and poolside cabanas for massages in the warm sun. 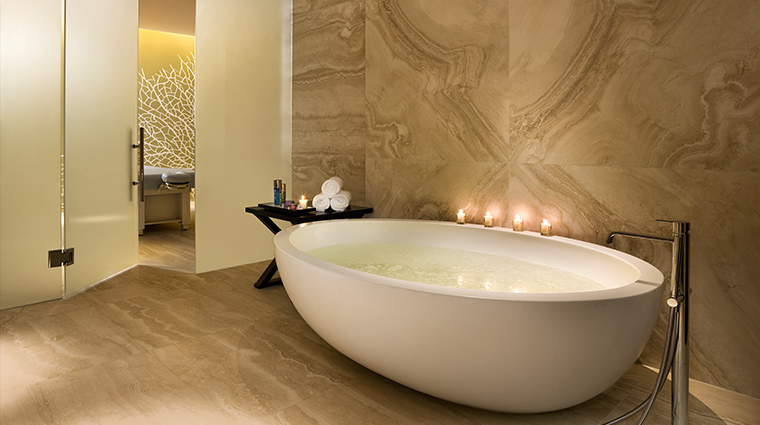 The spa’s spacious couples treatment room is particularly exquisite, with matching marble walls and floors, a two-person soaking tub, a private rain shower and separate treatment areas. 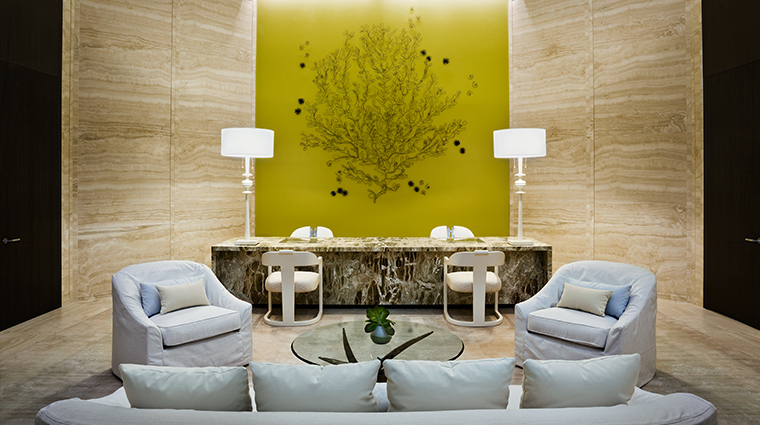 In addition, this top-shelf Miami spa offers a few unique treatments — for example, the Bal Harbour 24-karat Designer Facial includes a peel followed by a gold oil treatment. • The resort spa has a style that is at once understated and dramatic. 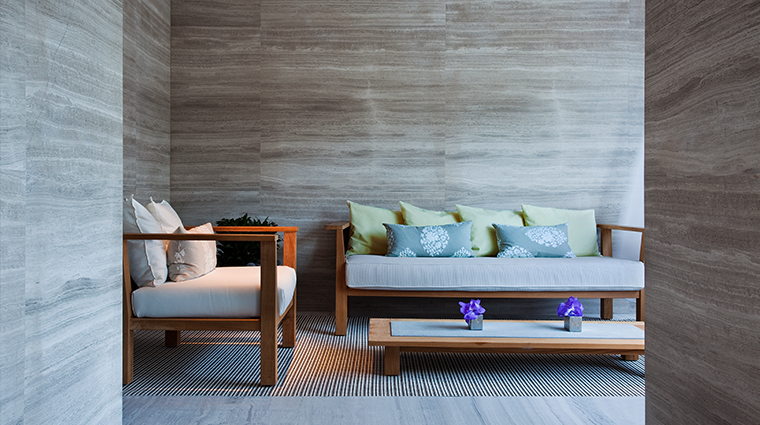 • The lemongrass-scented reception lounge sets the tone for a relaxing experience. 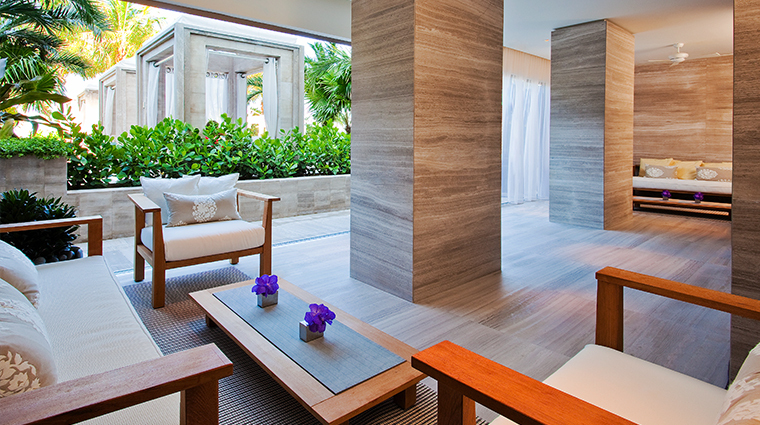 • Seaside motifs featuring exquisite coral configurations trickle through the Five-Star spa's interiors, along with a palette of serene neutrals. • Heated marble floors warm your path, while softly lit marble hallways cosset you in an oasis of refinement and tranquility. • Fantastic ocean vistas are to be had in the relaxation lounge. • To secure a coveted appointment at Remède Spa Bal Harbour, you would be well advised to book as far in advance as possible. • If you are staying at the resort, the concierge staff can assist with arranging an appointment, and can sometimes secure same-day bookings. • Although the sanctuary occupies a generous 14,000 square feet, it’s not uncommon for its 11 treatment rooms to be all reserved. • If you are visiting the Miami spa only, call it directly to make your appointment. • Plan to arrive at least 30 minutes prior to your scheduled time, so you can indulge in the superb amenities. • Recognizing that your needs vary from day to day, technicians will customize your massage to address your desires du jour. • Allow their repertoire of techniques, aromatherapy blends and warm paraffin to skillfully transport you to a renewed state. • Hot-stone massage is available to assist with deep-tissue work, and the reflexology foot rubdown is also a popular option. • For expectant mothers, prenatal massage promotes skin elasticity and restores mind-body harmony. • Try the signature Bal Harbour Brilliance Massage, which harnesses the power of chakra-balancing crystals to release blocked energy pathways and produce a profound sense of well-being. • From the invigorating whirlpool to the supreme Vichy rain shower, the wet areas at this St. Regis spa are astonishing to say the least. • The Finnish sauna and aromatic steam room make up the stress-relieving thermal suite. • The wet and thermal spaces eventually lead you to 11 luxurious treatment rooms enhanced by exotic orchids, creating an environment sure to wash your cares away with the next outgoing ocean tide.